So a year later, I'm sort of faced with the same issue I've generally started with. I can NOT for the life of me figure out what it is. Any help is greatly appreciated. Here is what was done so far. 2018 - First blame was put towards the bottom end. So we pulled the bottom end, and I ended up buying a brand new OEM 0 mile shortblock straight from local Mitsubishi Dealer. Noise was still there. Proceeded to break the engine in and continue driving it. A few months go by. Oil sample was sent for analysis after about 4k miles. No shavings, no contaminates, everything is normal. Next we swapped out the BC cams to stock Evo 9 cams. Engine was MUCH quieter afterwards, but still made the noise as what is shown in the video. Went ahead and bought a good used Evo IX head. Swapped it out. SAME, EXACT, NOISE is STILL PRESENT. The only thing that is from my previous head is the MIVEC Cam Gear as it still relatively new from STM. ( my old MIVEC Cam Gear made terrible noise under boost ). This head was perfectly running in the previous car it came from. At this point, I am at a total loss. Pretty much the block and head have been changed. It is a completely different engine at this point, with the same exact noise. Getting the feeling the car is cursed. I've tried using a stethoscope on certain areas, but nothing out of the ordinary. Also, you from the outside the engine sounds completely normal. I can get a video of that if it'll help. Here is a more detailed video. I couldnt hear anything in the video (maybe its just my speakers). My evo has developed a few noises over the years and i just do my normal checks and if i cant find anything wrong, i just turn up the radio. You went as far as replacing the entire engine, thats more than i would have done especially with the engine running normal. I really dont know what to suggest because it seems like you checked all the right things. Id say either ignore it until something breaks, or sell the car and buy one that doesnt make that noise. Just my opinion tho take it with a grain of salt. Thanks for the reply. At this point, I am just driving it, and if something gives, then so be it. But I'd still like to trace what the noise is. You can hear it well around the 19 second mark. That ticking noise is what I am after. I do get that 4G63's are noisy in general, but this sound isn't normal. Local Evo friends don't know what to make of the sound, nor do they experience it. I went ahead and pulled off the serpentine/accessory belt off to see if maybe the tapping was coming from the alternator, power steering, something other then the engine. But still no difference with the belt off. I sort of want to blame the MIVEC system for this noise. Maybe the car was on a previous tune for the old BC camshafts, and when swapping over to the Stock Evo 9's, it threw something off. Just a theory. I can hear it now.. very interesting noise. One thing i would check just for fun before id call it quits is to pull the purge valve off and plug the port. Also on the evap system canister close valve. Back in my automotive wrench days i had a car that would make a clicking sound (not exactly like yours) but it was also rpm dependent. The seal inside the purge valve wouldnt hold vacuum and would make noise, the catch was that the purge valve was bolted to the firewall so the noise would travel into the cabin. Just one last thing id check before taking a break from that. Thanks for the suggestion. No real change other then the check engine light coming on after which is normal. Really want to get rid of this ticking noise so badly lol. Yea i know how you feel. Youll find it eventually lol. A few years ago i had a pop that i could feel thru my steering wheel. After several inspections, ball joint checks, and bushing checks, i gave up. I finally found it kind of on accident, i was checking if my struts were starting to leak up front and i found a pile of rocks lodged into the strut where the spring sits. I cleaned them all out and never heard the noise again. 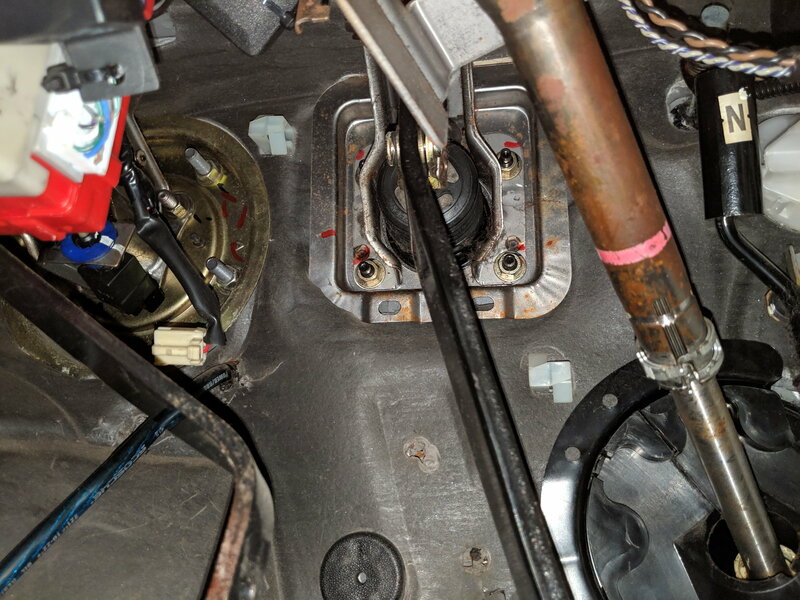 The fact that I can't hear the noise outside / under the engine bay, and only from inside the cabin gives me some sort of comfort in knowing that it's nothing directly wrong with the power-train. This is what my brain wants to think anyway lol. It's just during highway drives, it does get annoying. A/C and music is the only way to drown it out for now till I figure out what is exactly going on. There's a noise absorption pad located on the cabin firewall around the steering column. That pad (about 5 inches in diameter) literately falls off when the steering column is pulled. When my pad fell off one day as I worked on the car I figured it wasn't doing much and cast it aside. But then I noticed increased racket from the engine compartment. So, suggest you check if yours is still present. The outline of the thing is sorta like a frog. Thanks! Will check this out tomorrow. This is what my cabin firewall looks like at the moment. So just as a test, I sealed up the area pretty well with some insulation material I had. I went way over-kill, and no change in noise. The tapping sound comes through way too clearly. Which got me wondering, those who own RS's that have no insulation at all which I've been in, don't have this noise at all. So going back to the drawing board, the only two things that I could think of that haven't been changed out are either the Injectors being super loud, or the MIVEC cam gear? ( can it make this noise? ). Either that, or I bought a head that happened to have the SAME exact issue my previous head had. Odd's of that are very unlikely I'd like to think. Man ive had this noise or similar forever. It is at a certain rpm. Around 2k i want to say. Like you, i went crazy looking for what it could be but could not find it. Now, i have an evo 8 so no mivec. I can tell you it is not your mivec gear. My engine is healthy. Now, i have tq solution motor mounts which rattle like crazy so i figured it was something in the firewall rattling. I said screw it, turn the music up, and call it a day. Let me know if you figure it out lol. * Also, i replaced all of my lifters with brand new lifters when i installed gsc s2 and did a head gasket. So i dont think its lifters either. Last edited by nor11384; Apr 14, 2019 at 02:28 PM. Care to share a video of it? Thing is, the noise travels upwards all the way to red-line. Not that I've taken it that far. On the highway, you can definitely hear it. The tapping/knocking/whatever sounds like it's screaming. To the point where the girlfriend has asked "is your car going to be ok? the engine sounds loud and weird"
I've also unplugged injectors one by one, and no change either. So it's likely not those. Well, then it must be a different noise. I thought yours was also around 2k rpms. Mine goes away after that. My car is taken apart atm due to me building these chassis braces but will soon be put together. Mine you have to listen for it.